HTC hasn’t been doing so well in the past few years, if you look at smartphone sales numbers as well as profits. But it looks like the company will soon try to make some money off its software too, and not just hardware. 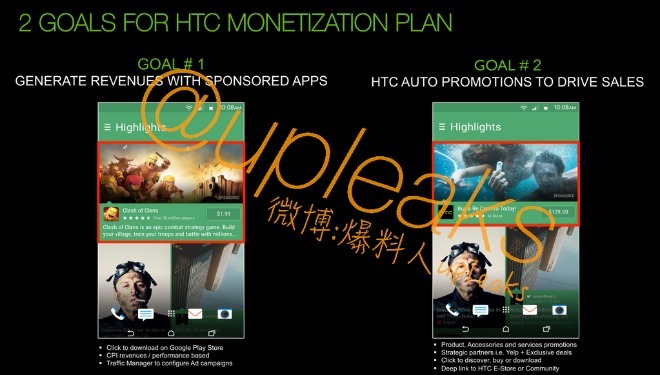 A leaked document purportedly originating at HTC shows us plans for introducing ads into Blinkfeed. As you may know, Blinkfeed is the home screen newsfeed that’s built into HTC’s Sense UI that sits atop Android in all the devices it ships. Blinkfeed has been released into the Google Play Store a while back, allowing for faster updates. And now it looks like one such future update could bring with it ads. In the first of two examples, an ad for an Android app shows up in Blinkfeed among news stories. If you’re interested in that app, you’ll be able to go to the Play Store to download it with just one tap. The second example showcased by HTC is an ad for its Re camera, so commercials advertising actual physical products will be allowed too. You can then tap to discover more about each product, or buy it immediately. There’s also mention of “strategic partners” such as Yelp, exclusive deals, CPI revenues, and a Traffic Manager that will be released for configuring ad campaigns by interested third parties. All of this will make Blinkfeed look a lot more like Facebook or Twitter, as the social networks also interrupt their respective feeds with such ads. Of course, ads in Android apps are nothing new, but this is a rather special case because Blinkfeed can’t be installed on non-HTC devices, and it comes built into any smartphone sold by the Taiwanese company. So although this ad integration is apparently only in the planning stages right now, an uproar is sure to follow.